Shri Sai Baba is revered as one of the greatest saints ever seen in India, endowed with unprecedented powers, and is worshipped as a God incarnate. SAI means Sakshaat Ishwar (Supreme Godhead). Some of HIS Hindu and Muslim followers regard HIM as a Saint, some as an incarnation of Lord Shiva or Lord Dattatreya or Saint Kabir. Some believed HIM as a Satguru. However we treat HIM, it is true that, Shri Sai Baba is among the most influential spiritual gurus of India, who lived at a nondescript village of Shirdi in the state of Maharashtra, India. With HIS miraculous powers and captivating teachings, HE is been ruling the hearts of millions of HIS devotees, whose number is ever growing with each passing day. 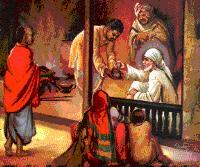 HE begged for alms and shared what HE got with HIS devotees and all the creatures around HIM. HE never kept any food in reserve for the next meal. Sai Baba conquered this Samsar (worldly existence), which is like a deep sea, very difficult and hard to cross. Peace or mental calm was HIS ornament and HE was the repository of wisdom. HE was the home of Vaishnava devotees, most liberal amongst liberals, the quintessence of all essences. HE had no love for perishable things and was always engrossed in self-realization, which was HIS sole concern. Baba felt no pleasure in the mundane things of this world or of the world beyond. HIS Antarang (heart) was as clear as a mirror and HIS speech always rained nectar. The rich or poor people were the same to HIM. SAI did not know or care for honor or dishonour. 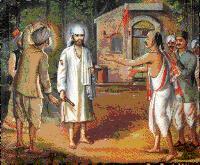 This mysterious Fakir first made HIS appearance in Shirdi as a 16 year old boy and disappeared. Three years later, Mahalsapati Chimanji Nagare, the priest of Khandoba (the village Deity), identified this young Fakir in a marriage party that visited Shirdi and uttered with devotion,"YA SAI", means Welcome SAI. 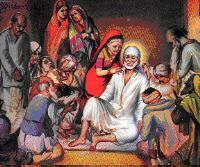 Since then others also addressed HIM as SAI and thenceforth HE became known as SAI BABA. HE transformed the lives of those who met HIM and continuously is doing so even after HIS Samadhi in 1918 for those whose hearts are touched by HIS love and who pray and call HIM at any emergency in life for HIS blessings. If you think that HE was a Hindu, HE looked like a Muslim. If you think HIM to be a Muslim, HE looked like a pious Hindu. No one definitely knew whether HE was a Hindu or a Mohammedan. Inferences could be drawn from HIS dress or body features but all such superficial inferences were meaningless. They did not serve any purpose. HE celebrated the Hindu festival of Rama-Navami with all due formalities and at the same time permitted the 'Sandal' procession of the Mohammedans. HE encouraged wrestling bouts in this festival and gave good prizes to winners. When the Gokul Ashtami came, HE got the 'Gopal-Kala' ceremony duly performed and on 'Id' festivals, SAI allowed Mohammedans to say their prayers (Namaj) in HIS Masjid (Dwarakamai). 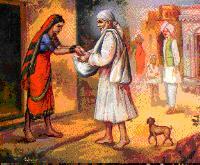 It is well-known that Baba took Dakshina (donation) from all, and out of the amount thus collected, HE spent a lot on charity and purchased fuel with the balance left with HIM. This fuel HE threw in the 'Dhuni' - the sacred fire, which HE kept ever burning. The ash from this fire was called Udi and it was freely distributed to the devotees at the time of their departure from Shirdi. Udi has been used to cure many diseases during and after Baba's reign. HE was the common man's God. HE lived with them; HE slept and ate with them. Baba had a keen sense of humour. HE shared a 'chillum' (clay pipe for smoking) indiscriminately with them to write off the cast superiority and orthodoxy in their minds. HE had no pretensions of any kind . HE was always very playful in the presence of children. 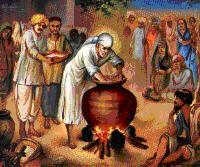 Baba used to feed the fakirs and devotees and even cook for them. Saibaba's perfect purity, benevolence, non -attachment, compassion and other virtues evoked deep reverence in the villagers around HIM. HIS divinity could not conceal itself for long. Initially when people wanted to worship HIM formally, Baba protested and dissuaded them. But gradually HE allowed it with the prescience that it would become the means for temporal and spiritual benefits to millions of individuals for all time to come. 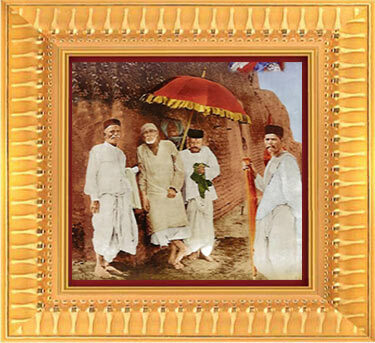 The Dwarkamai of Sai Baba was open to all, irrespective of caste, creed and religion. As the days passed, devotees from all walks of life started streaming into Shirdi. The village Shirdi was fast assuming prominence. 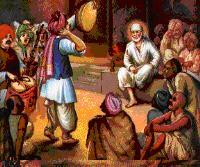 As the gifts and presentations flowed in, the pomp and grandeur of Sai worship also increased. But Baba's life of a fakir remained calm, undisturbed, unaltered and there is the Saint's spiritual glory. HE lived HIS divine mission through HIS pure self in a human embodiment. The immense energy that was manifested in the body of Sai was moving in a mysterious way, creating and recreating itself every where beyond the comprehension of time and space. This fountainhead of unsurpassed spiritual glory shed HIS gross body on 15th October 1918. Every limb, every bone and pore of HIS body was permeated with divine essence. Baba claimed that though one day HIS physical body will not exist, HIS remains will communicate with all those who seek HIM with inner yearnings. HIS self-allotted labour of love in HIS physical body was perhaps over. Today HE continues to work ever vigorously as the 'Sai Spirit'.